Stone:AAA Cubic Zirconia. Plating:Gold Plated. Earrings Size:Refer to Picture. Stone: AAA Cubic Zirconia. Surface: Gold Plated. Stone:AAA Cubic Zirconia. Earrings Size:Refer to Picture. Quality:Excellent Quality of Warranty. Brand: HUCHE; Metal: 18k Yellow Gold Filled; Size: 34m / 6mm; Set Weight: 3.4g; Main Stones: Cubic Zirconia; Secondary Stones: Cubic Zirconia; Gem Quantity: 4; Main Stone Color: White; Main Stone Size: 9mm/6mm . You will receive: 1x Pair of Earrings; 1x Box. If you're looking for bulk orders, please don't hesitate to send eBay messages for more details. If you are looking for other colors, please search eBay for item ID 282874316347 and BUY IT NOW!! Metal Type: 18k white Gold Filled Gem Type: Cubic Zirconia Gem quantity: 60 Main gem size: 1mm Earring size: 13*15mm Total Weight: 5.4g Retail Price:$28 Come with a pretty box 100% Money Back Guarantee Package Includes: 1x Paif of Earrings 1x Gift Box If you're looking for bulk orders, please don't hesitate to send eBay messages for more details. Stone: AAA Cubic Zirconia. Quality: High Quality of Warranty. Stone:AAA Cubic Zirconia. Earrings Size:Refer to Picture. Material: Brass. Main Stone: Cubic Zirconia. 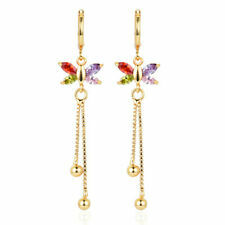 Fashion cubic zirconia yellow gold Filled small square stud earrings cute earing. Material: 9K White gold filled. 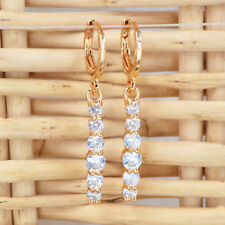 Fashion Two-Tone Filigree Gold/Silver Plated Round lace carved Hoop Earrings.